Beat The Average Tier (pay $11.90+) gives you the Mega Man 9 & Mega Man 10 combo pack AND four Capcom PlayStation titles: Strider (PS3 or PS4), Final Fight: Double Impact (PS3), Wolf of the Battlefield: Commando 3 (PS3), Super Puzzle Fighter II HD Remix (PS3), and 45% off Street Fighter V digital (PS4). If you pay $15 or more, you're eligible to snag Mega Man Legacy Collection for 50% off (valid until October 1st), all of the games in the Beat The Average Tier AND Resident Evil Remake (PS4/PS3), Resident Evil 0 (PS3/PS4), Devil May Cry HD Collection (PS3), Okami HD (PS3), Remember Me (PS3), and Lost Planet 3 (PS3). If this tickled your fancy, you can scope out the bundle here. I already have all the Mega Man games in it but the bundle is still great. Been wanting an excuse to get the RE0 remaster. Strider is fantastic and is worth $12 all by itself. Does anyone know if Megaman 9&10 come with all the DLC? We're talking about CAPCOM here; considering that part of this charity deal is just a discount on specific games (instead of fully including those specific games) I don't think they'd pass-up an opportunity to further monetize other, fully-included, titles for this charity event. Also: I think they would advertise the DLC to make it more appealing for donors, so I'm going to guess DLC is not included. 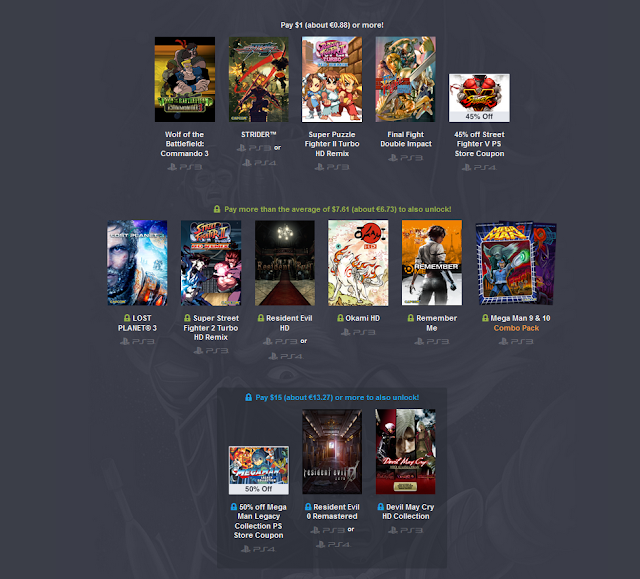 Just found out that there's a big retro sale on the EU PSN stores. Both Megaman 9&10 complete editions are half off. So 10 euros for both games and all DLC. Good deal if anyone wants just the Mega Man games.